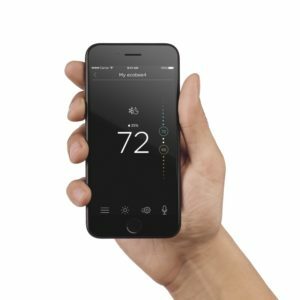 Ecobee 4, the newest smart thermostat released on the market in 2017, is one of the hottest products. On Amazon, Ecobee 4 is the no.1 in New Releases and is poised to become the top thermostat of the year. According to the manufacturer, Ecobee 4 is more than a smart thermostat. Featuring a powerful room sensor and the built-in Amazon Echo service (or Alexa), this advanced thermostat includes everything you will ever need in order to get a smarter home and to transform your living environment. Ecobee 4 is the newest product out of a whole series of top smart thermostats created by Ecobee. This manufacturer has been in the thermostat business for quite a while now, but it was never able to stand toe to toe with Nest’s stylish and high-performance devices, until now. While Nest is still selling their old learning thermostat, Ecobee have continually innovated and have managed to create the best smart thermostat the world has ever seen. 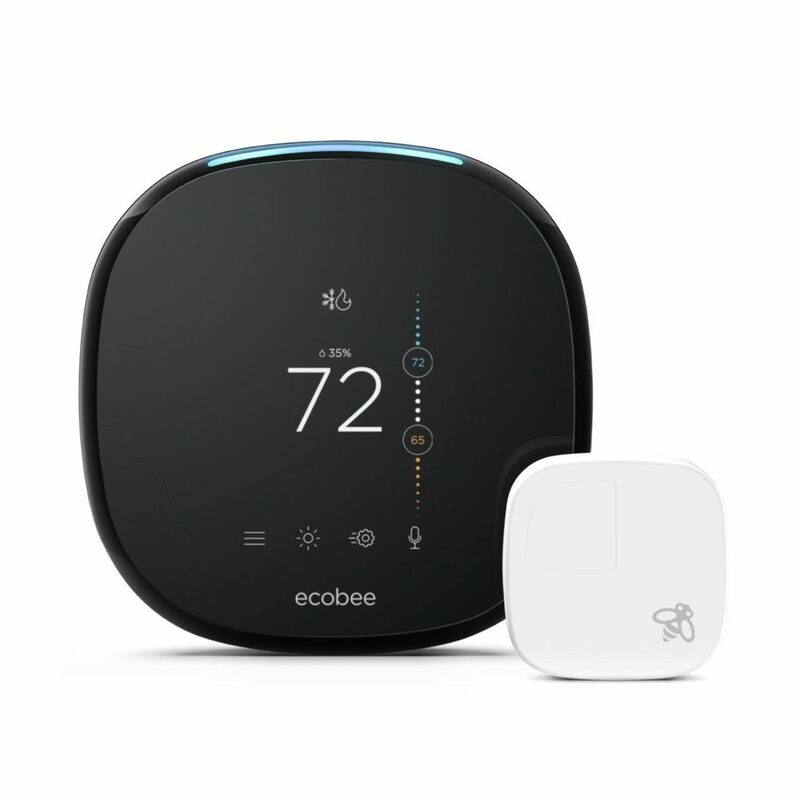 Ecobee 4 was released out of the need of increased connectivity and usability. No other previous thermostat was able to use Alexa in order to make your home become smarter. Moreover, very few smart thermostats are able to help you save a whopping 23 percent in heating and cooling costs. This device has been specially engineered to blend in with other appliances in your home and reduce the carbon footprint considerably by making your house become green. The need for Ecobee 4 also arises out of a stringent desire of modern users to save time and to automate their daily tasks, such as knowing the time, reading the news or checking out the weather. Once you pre-order Ecobee 4 and take it out of the box, you can’t but notice its exquisite design. Even if it has the same overall traits as its younger brother, the Ecobee 3, the fourth version has a sleeker, better design. The iconic design features a beautiful blue-line at the top which acts as a portal between you and Alexa. Visually, Ecobee 4 features a beautiful touchscreen that displays the mode, humidity level indoors, current temperature, settings, updates and alerts. Compared to Ecobee 3, the touchscreen is much more responsive and works easier. Once you take the device out of the box, you notice that the whole installation process takes less than 15 minutes. Most other smart thermostats take up to 40 minutes to install, maybe even more, not Ecobee 4. This modern device comes with a built-in leveler which makes it ready to install. If you have ever installed a smart thermostat before, you noticed that it needs to be perfectly leveled. That task alone could take you up to 15 minutes, even being equipped with the right tools for the job. With Ecobee 4 you won’t experience this issue. By following the instructions in the installation manual, you can complete the installation in less than 15 minutes. After you install it in your room of choice, preferably in your bedroom, the device goes through a self-check assessment in order to ensure that all the wiring is in place. This assessment is more than necessary, as it ensures that the thermostat does not damage your HVAC unit. After installing the Ecobee WiFi thermostat, set aside another hour or so to go through the details and personalize it according to your own needs and interests. You can play with your new toy and install more sensors in each room. The registration is the final hurdle in the installation process. You can easily connect your new thermostat to the web. Simply access the WiFi connection tab on the screen, select your preferred connection, enter the password and you’re good to go. Do not forget to create an account on the Ecobee site and download the app on your mobile devices. From this point on, you can leverage the amazing benefits of Ecobee 4. Thanks to the obsessive engineering behind it, Ecobee 4 is specially designed to be seen and heard. The engineers from Ecobee have managed to equip it with multiple far-field voice recognition microphones similar to the ones Alexa is equipped with. The embedded speaker can be heard loud and clear, so the whole communication process is streamlined. The sound has really impressed us, along with hundreds of other reviewers who have already tried the device. The sound is even better than what Amazon Echo can produce. You can even stream your favorite audio in the room and the quality is exceptional. Setting out the remote sensors is just as easy as it was with Ecobee 3. You can read the temperature in various places across your house and manage those hot and cold spots extremely good. By placing sensors in your favorite rooms, you will be able to easily control the temperature all-around and enjoy the comfort you crave for. You can also have comfort of the go, even after you have left the house, by controlling each sensor on your mobile device. Ecobee 4 is a device being specially designed to make your life easier and to help you save precious time when performing the daily tasks. It works flawlessly with IFTTT, Apple HomeKit, Samsung SmartKits and many other home automation systems. You can integrate it with tons of smart home systems in order to set alerts & reminders, turn on/off your lights, lower indoor humidity, recover the lost temperature and do many other tasks in your kitchen or living room. Ecobee 4, just like its younger version, has partnered up with IFTTT, SmartThings, Wink and a handful of other third-parties to help automate your home. For example, with IFTTT you can create your own rules, such as if the Ecobee 4 switches to away mode, it can send you a mobile notification” or if the temperature drops below 70 degrees, start the device and send an email notification. Similarly, the SmartThings and Wink integrations offers additional opportunities for Ecobee 4 to be part of a multi-protocol home system. To find out more about Ecobee’s integration with Wink and IFTTT, check this platform. However, what really sets Ecobee 4 out in its market is its capacity to make the most out of Amazon Alexa. This new voice-enabled smart thermostat allow you to fulfill every single task in the shortest amount of time. For instance, you can order for groceries, check the weather or add a new entry in your calendar in less than 10 seconds. Imagine that you are throwing a last-minute party. Simply ask Ecobee 4 to guide you through the whole process, from choosing the most trendy recipes to selecting the most appropriate music for your event. The same goes true when you want to have dinner out in the city and you are not sure where to go. You can ask Ecobee for the hottest places to eat and even ask it to read you some client testimonials. With Ecobee 4 by your side, you can rest assured that you will always have access to any type of information you need, even while cooking, washing dishes, ironing your clothes or fixing your hair. No more wasting time trying to find out what you need by trying to type on your smartphone’s small keypad. In terms of design, Ecobee 4 gives Nest 3 a run for its money. While Nest 3rd generation has a simple round design, it lacks Ecobee’s unique features and smooth lines. Ecobee is also slightly larger than Nest, which makes it an excellent piece of architecture that complements your home design. As far as installation is concerned, Nest is slightly easier to install than Ecobee 4. However, if you’ve ever installed a remote sensor from Ecobee 3 before, the whole installation task should become much easier and should not exceed 15 minutes. While Nest’s main goal is simplicity, Ecobee’s goal is uniqueness and usability. The full-color touchscreen that Ecobee 4 is equipped with gives Nest’s simple screen a run for its money. In terms of operating patterns and energy savings, Nest 3 is a learning thermostat that tracks the changes in temperature over a duration of time. The whole learning process could take up months, so the savings could not be visible until after more than 6 months. Conversely, Ecobee 4 uses a complex system of remote sensors placed all around your home which give real-time feedback and enable you to adjust the temperature right away. In addition to the sensors, Ecobee also incorporates time of day, weather forecasts, plus several other factors. With Ecobee 4, you can save money right away, and you can usually save up to 15 percent more with this smart thermostat than with its counterpart from Nest. In terms of features, Ecobee 4 can integrate with Alexa, OpenHab, Apple Homekit, Wink and IFTTT. Nest 3 integrates with all of the above, plus Google Now for voice-activated commands. However, Ecobee 4 is equipped with a better speaker and offers more streamlined communication patterns. Ecobee 4 supports access for humidifiers, dehumidifiers, ventilators, ERV and HRV, plus it comes with preset schedules. It also comes equipped with geofencing, thermal protection and sensor participation. On the other hand, Nest comes with the Protect and Cam features, plus a large family account to accommodate the whole family. Neither of these two comes with game changer features, so it is fair to say that both deserve a well-earned place one in terms of features. As for price, they both come with a similar price of $250. As it is just being released, Ecobee 4 has a higher price, which will decrease in the months to follow. Ecobee 3, which was quite similar to Nest 3, came with a lower price, but it couldn’t stand up to what Ecobee 4 has to offer. In the end Ecobee4 vs Nest battle is won by no other than Ecobee 4. This modern smart thermostat is faster, more clever, looks better and has more autonomous capabilities than its counterpart from Nest.